Is Jamaica Blue Cold Brew Vancouver’s Best Iced Coffee? Fellow iced coffee lovers, you must try Jamaica Blue Cold Brew a coffee concentrate roasted and bottled by hand here in Vancouver. It’s only available from a food truck (its namesake) and it may be the smoothest sipping around thanks to its origin. Known for their low acidity, Jamaica’s Blue Mountain coffee beans (said to be brewed at The White House and favoured by the Queen of England herself) are shade-grown in volcanic soil 7400 feet above sea level, meaning they’re big, dense and extra flavourful. In order to sell these exclusive beans, vendors must be certified by the Jamaican Government. And the process isn’t easy, but Chris McKenzie (the only recognized supplier in Vancouver) felt it was worth it. At $40 to $50 a pound, they’re some of the world’s most expensive beans, but I bet coffee snobs will agree they’re worth it. 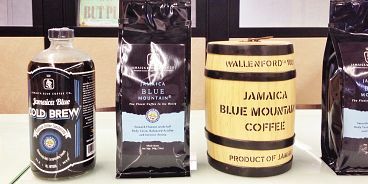 The one litre bottles of coffee concentrate available at @JamBlueColdBrew Food Truck are only $18 which last for at least 10 glasses (try poured on ice cream or in baking, too). You can also buy single portions of the cold brew on tap for about $4. To locate Jamaica Blue Cold Brew Food Truck, head to Street Food App on your smart phone or get to one of the summer street food festivals like Food Cart Fast every sunday or the North Van Shipyards Market on Friday nights.